This new ancient DNA study refutes the Afrocentrist claim that Natufians were from Sub-Saharan Africa or had Negroid admixture. 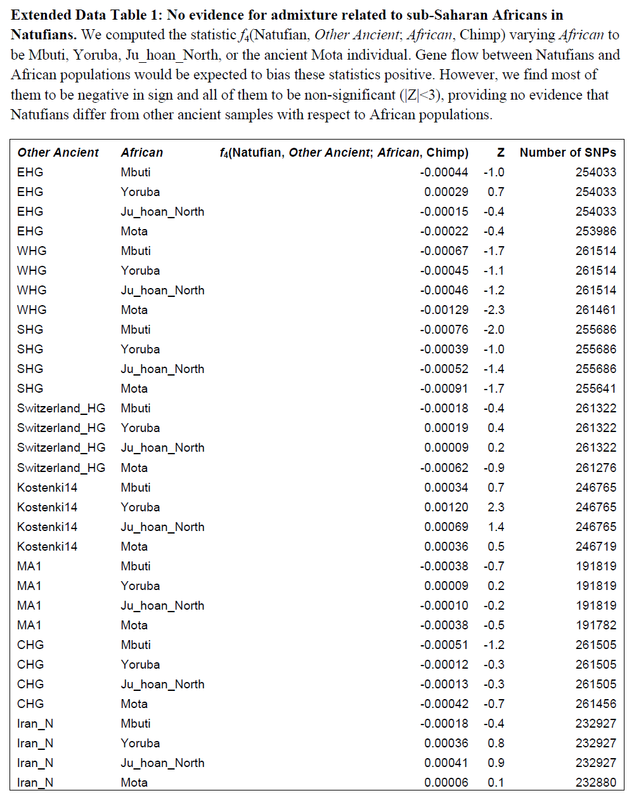 Craniometric analyses have suggested that the Natufians may have migrated from north or sub-Saharan Africa, a result that finds some support from Y chromosome analysis which shows that the Natufians and successor Levantine Neolithic populations carried haplogroup E, of likely ultimate African origin, which has not been detected in other ancient males from West Eurasia (Supplementary Information, section 6). However, no affinity of Natufians to sub-Saharan Africans is evident in our genome-wide analysis, as present-day sub-Saharan Africans do not share more alleles with Natufians than with other ancient Eurasians (Extended Data Table 1). Lazaridis et al. "The genetic structure of the world's first farmers". bioRxiv, 2016.